Fire crews in the South Bay were able to quickly extinguish a brush blaze late Monday night on Stevens Canyon Road in Cupertino. The blaze was initially ignited when a truck caught fire and then the flames swiftly spread up a nearby hillside, according to fire officials from Santa Clara County and Cal Fire. 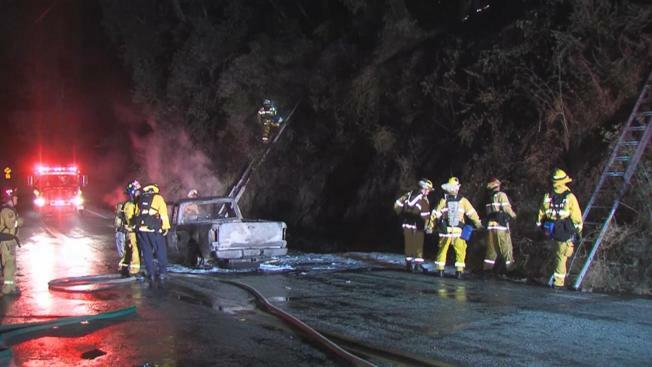 The driver was reportedly trapped inside the vehicle as flames began to engulf the truck, but three young witnesses were able to pull the man to safety, officials said. Firefighters were able to douse the hillside flames in under 15 minutes before putting out the fire that had consumed the vehicle, officials said. The driver was transported to a burn center to be treated for unknown injuries, according to officials. Arson investigators are looking into how the fire first started, officials said.